Cocoa is rich in plant chemicals called flavanols that may help to protect the heart. Dark chocolate contains up to 2-3 times more flavanol-rich cocoa solids than milk chocolate. Flavanols have been shown to support the production of nitric oxide in the the inner cell lining of blood vessels which helps to relax the blood vessels and improve blood flow, thereby lowering blood pressure. Other observational studies suggest a link between high cocoa or chocolate intake of 6 grams daily (1-2 small squares) and a reduced risk of heart disease and mortality, possibly in part by reducing blood pressure and inflammation. Dark chocolate is high in calories (150-170 calories per ounce) and can contribute to poor health and weight gain if eaten in excess. Sugar content also plays a role in how chocolate intake should be moderated. It also contains a moderate amount of saturated fat, which can negatively affect blood lipid levels, though its heart-protective effects from flavanols appear to outweigh the risk. 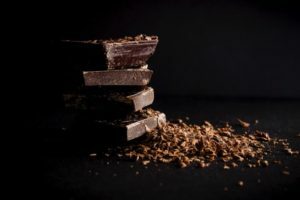 Choosing the darkest chocolate you can tolerate and eating modest quantities may offer the greatest health benefits. Choose 70% dark chocolate or higher to obtain the most flavanols. Store in a cool dry area (65-70 F) in a tightly sealed container. Do not refrigerate, which can promote the chocolate to “bloom,” a whitish coating caused by sugar rising to the surface due to excess moisture. Bloom does not affect flavor but does not look appealing. If stored properly, dark chocolate will last up to two years.